Dual mono design with two toroidal power transformers and choke-regulation. Tube rectification resulting in stunning midrange bloom. Point to point internal wiring. Premium parts including Alps Blue Velvet Potentiometer, Solen and Swellong capacitors. Five coats of hand-rubbed finish on heavy-duty chassis. Removable tube cage. Low output impedance compatible with tube or solid state power amps. Two sets of line outputs for bi-amping or adding powered subwoofer. The PrimaLuna Prologue 3 has a wonderfully vivid presentation that falls a bit on the warm side of neutral. The result is a natural and organic timbre to voices and instruments alike. As such, it's a perfect match for my Usher Mini Dancer Two DMD speakers --- which are extremely detailed -- and my Odyssey Stereo Khartago Extreme SE amplifier, which is a very dynamic solid state performer. Having heard much more expensive preamplifiers in my system, I find this to be an extremely gratify9ing performer. Bottom line, I am very pleased with it. Not having a remote controller would be about it. However, that's not a big deal to me. I recently upgrade to this preamp. I am specifically looking for a tube preamp with tubes exposed. There are not too many choices out there, and I decided to give this a try based on relatively good reviews from 6moons and Stereophile. And I am blown away. I use a reputable tube hybrid preamp before, but this one blow that one away in every aspect. Vocal is warmer and sweeter, bass is tighter, sound stage is both wider and deeper. I never listen to longer than 3 hours before. After I upgrade to this unit, I almost listen 3-4 hours every night without fatigue. It is absolutely quiet, no buzz and hum. The volume control is silky smooth. The stock PrimaLuna tube is quite good already, and the sound improve further after I change a pair of Tungsram 1967 12AX7 and CBS 12AU7. This is the most expensive preamp I used so far, so, I can't say this is the best preamp out there. But the value is definitely is extremely good. This unit is $300 more than my previous one, and I am extremely happy with what I get, worth every extra penny. No remote, but I doesn't bother me. I had been in the market for a new Pre-amp for a couple of years. I had bought tubes from Kevin at Upscale Audio before, so he told me to audition the Prologue 3 and see what I thought. The PrimaLuna Prologue 3 will be the last pre-amp I ever have to buy. First, the build quality is second to none. The point to point wiring is first rate, and parts quality is that of pre-amps that cost 3 times as much. The dark blue powder coat on the outside is beautiful. The build quality is something you would expect from a $6,000 pre-amp. Second, the sound is simply great. The soundstage is big, wide, and 3 dimensional. The high's are crisp, and clear, but not rolled off like with some tube pre-amps. The midrange is just beautiful. Female vocals through the Prologue 3 are just spellbinding. The bass is tight, and focused; without any sense of flab. I've had Rotel, Adcom, and McIntosh pre-amps throughout my time in this hobby, and the Prologue 3 has bested all my previous pre-amps. For $1,499 that I paid, this thing is a complete steal. I will happily enjoy the Prologue 3 for many years to come. I've had zero problems. If I every do, I know dealing with Kevin at Upscale Audio will no problem. Has a very nice open sound without rolling off at the highs. Low cost for high quality. First off,I am a music lover much more than an audiophile. When I plug something in it is the sound that I care about. Yes,this pre amp. is very well built and has point to point wiring. This in itself does not necessarily mean it's going to sound great. Much time and energy was put into the sound and that is what I care about. I have had many amps and pre amp in my house over the years. My preference is analogue with all tubes and silver cables. In the six months of listening to the pre amp I can say that it is well worth the $1395 it sells for. I like it better than the Musical Fidelity A3.2cr that I had and it is much better than my Ead theatermaster 8800 as a line stage. This is not 1950's tube amp. technology. It does auto biasing when turned on and is very easy to tube roll. A better pre amp can be bought,but at what price? 3 or 4k? Never had to call for anthing. Unbelievable sound remarkable soundstage. Its design and build quality is hands down the best I've seen. Dollar value--I don't know how they do it. Prior to purchasing the Prologue 3 I was using a solid state Rotel pre-amp. The Rotel was and is a wonderful pre-amp but I longed for "tube sound". Enter the Primaluna Prologue 3. What a great find. It uses the best capacitors available and a Alps pot as the volume control. The build quality is absolutely fantastic; with five coats of paint hand rubbed between coats and point to point wiring which is not only beautiful to see; but sonically superior to printed wiring boards. The Prologue 3 arrives triple boxed with a pair of cotton gloves included to prevent smudges to the finish. Kevin Deal at Upscale Audio has produced a truly beautiful unit not only visually, but in its sound quality. The sound quality,unbelievable at this price is truly a joy to listen to. I am impressed with the detail, the highs and midrange is breathtaking. Upscale Audio has a reputation for great service after the sale which is also why I purchased a Magnum Dynalab tuner from them. For those of you who are thinking of not buying it because it doesnt have a remote, get used to the idea of not having a remote now. You cant afford to buy a unit that touches the performance of this unit that has a remote. Dont overly judge this unit in the audition, it sounded way better at home. NO WEAKNESSES AT ALL! B&K Reference 5 S2 preamp. Rotel preamps. What a magnificent pre-amp. Opening the carton when it arrived was an eye opening experience. The pre-amp is beautiful, the finish stunning. The sound of the Prologue 3 is the best I have ever heard. The fact that it uses the best of components and assembled with stellar point-to-point wiring all adds up to a piece of audio equipment that must be seen and heard to be appreciated and believed. SUPERB! Kevin Deal at Upscale Audio took the time to answer all of my questions. A wonderful buying experience complete with instant shipping and the unit arriving triple boxed. Quality parts as Solen etc.,deep sound stage, three dimension, smooth mids and highs, extremely attractive and no tube biasing required. Well priced, and no good better,best to choose from, only one pre and thats it. This is a killer preamp at almost any price! Hall of fame parts list, sonic attributes to die for. Replaced a Arc ls3 and there is no comparison.Although the ls3 is transparent, the Prima Luna lets you see deeper into the music. More low level detail, more dimension even at low volume levels. Hiend is about extracting as much information, detail, resolution, and dimensionality, without mortgaging your home.This preamp matches well with solid state equiptment, as it has a very wide bandwidth.You can call it tube magic, or call it a good preamp and Prima Luna sets the stage for quality and price. As cousin Kevin says this preamp is awsome, no lie and he is not my cousin. Before you purchase something else give this preamp a listen, and you will find that any more money spent may just not be worth while. Haven"t used customer service other than to order new tubes. Sumo Athena pre , SAE pre, current equipt is Aragon 8008 BB amp, highly modified Jolida JD 100 cd player, Citation 23 tuner, All LAT int"l cables and speaker wiring Ic-300, and bi-wire, and power cables. Vandersteen 3A sigs. Superb build quality, a host of first rate parts,dual torrodial transformers, and a wide band width. Should mate well with most amps including solid state. Tubes upgradeable and recommended to get to the next level.At 32lbs it feels like a piece of equiptment, its primo! Not really, should come with upgraded tubes even if priced higher for the most discremenating. This preamp has to be the best bargain in hi-end. The construction, parts content, are all first rate.Sound is deep, three dimensional, airy, and awsome mids. All the superlative phrases in hi-end audio fit this preamp, except you dont have to sell your soul to own it. Rarely do you find a product with as much quality and value for your money. My hats off to all at Primaluna for such a wonderful piece of equiptment at a real world price! Just the music man! Great build and looks, comes with cage for the finishing touch. Just like the great designs from the past, with new applications for the 21st Century. Sorry, no remote, if your like me having to change the CD manually, doesn't require the remote function anyway for the volume control. 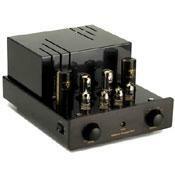 This is a tube music lover's preamplifier, I like the sound overall. This is a dual mono-tube rectified preamplifier. Today, virtually no other tube rectified dual mono tube preamplifier exists for sale new anymore. These units are truly WELL built, point to point wiring, best of caps, resistors etc, plus the design of soft start, which has NO affect or negatives to the sound, but extended tube life ease. This preamp is non-inverting for those who use bi-amping such as I, dual pair of RCA output jacks, one set of tape outputs and five pairs of inputs, great versatility. Output impedance is 2800 ohms, NO problem with tube or solid state amplifiers, drives just fine with sensitivity of 150mv for full output, overall gain is 12db, wide frequency response for GREAT BASS! Tubes used are: 2x5AR4, 2x12ax7, 2x12au7, many nos types available. This preamp delivers the goods! Inner detail, voices with the most three dimensional sound I have ever heard, with balanced sound staging left to right, front to back, deep bass extension approaching the best solid state designs with more depth and punch. Oh the music, listening to Ben Webster playing Soulville has re-invited several re-listens and everytime enjoyng the tunes even more. Such detail to Ben's tenor sax is breathtaking period. This is a re-mastered 1957 recording on the Verve label, such great tunes and sounds. No top end bite but smooth notes all the way, never fatiguing! I only wished I designed this preamp myself, wouldn't change a thing, just enjoy it. Kevin is great from Upscale Audio, three year warranty from manufacturer.